"The e-mails and financial statements of Republican Mitch McConnell's former campaign manager were subpoenaed a month before he quit as the senator's top aide. "That's according a grand jury document posted Thursday by The Center for Responsive Politics in a report about an ongoing federal investigation stemming from an alleged bribery of an Iowa legislator in 2012." First is that it undercuts the narrative that McConnell's campaign and the aide sought to establish when he resigned, which was that the bribery scandal only became an issue when a key player in the scandal pleaded guilty at the end of August. Instead, the scandal was very much on their radar screen, and had been for some time -- just not in public. 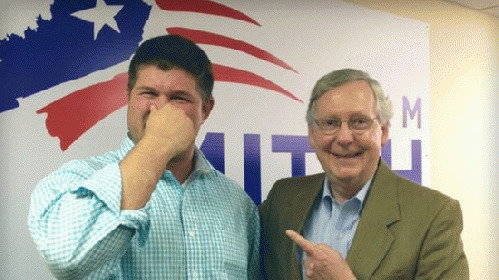 "Those subpoenas show the federal probe is focusing on the activities and businesses of Dimitri Kesari, a former Paul campaign official who was paid around $73,000 as a consultant for McConnell's campaign." The key questions about Kesari appear to be whether he orchestrated the payments to the Iowa legislator who pleaded guilty through a shell company pretending to be a video production outfit. If that proves to be the case, then it would be only fair to to ask whether the same thing happened with the money he was paid by McConnell. *Daily Kos Senior Policy Editor and Editor of Daily Kos TV. Former communications director for Sen. Maria Cantwell. @jedlewison on Twitter.